Once upon a time, I had no interest in reading books about getting things done. I had enough time, or at least close to enough time, to do the things I wanted to do. But as the amount of things I want to do has grown (and my capacity for doing them has not), I’ve looked for help. There is a whole host of books about productivity, with Getting Things Done by David Allen at the top of the list. I have found that book, and others like it, to be helpful. But they are usually for general audiences, and I have had to translate them into a language that I can use as a Christian. 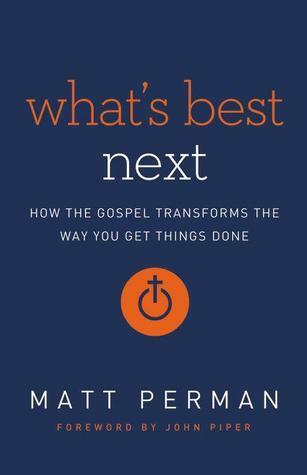 What’s Best Next, by Matt Perman, the former director of strategy for Desiring God ( begun by John Piper), is the book that I was looking for without even realizing it: a book on productivity that approaches it not merely to do more, but from the angle of getting things done for the glory of God. When I got this book in the mail, I was surprised at how thick it was. The book comes in seven parts. Part one is what sets this book apart; it asks what it looks like to make God supreme in our productivity. In part two, Perman introduces his own productivity system, which he calls Gospel-Driven Productivity. This system consists of four steps, which Perman details in the next four parts: Define, Architect, Reduce, and Execute (DARE). In part seven, Perman includes two chapters on living this out. I enjoyed much of this book. I appreciated Perman’s desire to adapt productivity literature for a Christian audience, and it was clear that he had spent a lot of time thinking about productivity. I am certain that I will start to implement some of Perman’s advice in my own life. There are just two negative things about the book for me. I already alluded to the first: its length. This is Perman’s first book, and I think he fell into the trap that many first-time authors fall into, which is trying to say everything they know about a subject. There’s a lot of good information here, but it could have been much shorter. The second minor quibble came in the second to last chapter, “Productivity in Organizations and Society.” Perman urges his readers to take an interest in economics because it has to do with people’s structural context. This is a good thing, in my opinion. However, Perman then recommends that his readers learn about economics by reading books by Thomas Sowell, Milton Friedman, and Friedrich Hayek, who are all representatives of the neoliberal school of economics. Now, I am not saying that people should not read these guys. They absolutely should. But, the last four decades or so in the United States notwithstanding, neoliberal economic thought is not the same as Christian economic thought. There is a robust and longstanding discussion among Christians about how to think about economics, and Perman does his readers a disservice when he intimates that there is no such discussion. Those minor difficulties aside, I would recommend this book to any person who is looking to get things done, and who wants to get them done for God’s glory. I give it 4.5 stars. Note: Thanks to the publisher for a review copy of this book. I was not asked to give a positive review. Also, for a limited time, the ebook version of Perman’s book is on sale.